Mariefields ( formerly Tagari Farm ) of Tyalgum where Bill Mollison developed the first Permaculture Farm in the world. It is 40 minute drive from Gold Coast airport via the Scenic Murwillumbah Route , 5 minutes from historic Tyalgum Village or a 65 minute drive to Byron Bay. 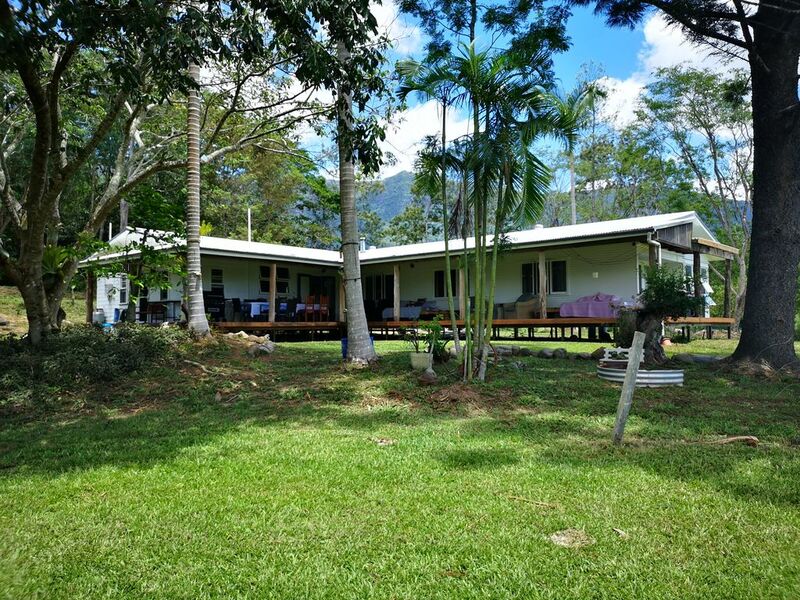 Our 165 acre property is very centrally located in the Northern Rivers of New South Wales close to Tyalgum ,Byron Bay , Uki ,Mt Warning and the Mebbin National Park. Enjoy our natural environment with the many National Park nature walks, great beaches and amazing places to go close-by when you stay at Mariefields. We are 5 minutes drive to Tyalgum township with the world famous Flutterbies Restaurant, a very well stocked local store that has all the food items you will need, a coffee shop , a gelato store, book ,antique and jewellery shops plus a great local hotel. Take a 20 minutes drive to Murwillumbah with great shopping, supermarkets ,restaurants and coffee shops as well as the world famous Tweed Art Gallery or drive on the Byron Bay for a day at the beach. The 4 king size beds can be converted to 8 king single beds on request. The 2 single bedrooms have king single beds with space for an extra bed. Extra beds can be made available if required at additional cost. All sheets, pillows ,doona and covers are provided, linen is luxurious and professionally cleaned. The property is well maintained and nearby on site assistance is provided if required. There a 2 separate modern bathrooms and 2 separate toilets. Enjoy our large family lounge room with leather lounges beside an old fashioned wood-fired fireplace, relax on our wide veranda in a comfortable lounge bed or listen to music with a drink around our outdoor fire-pit. Maybe just enjoy a BBQ on the huge timber veranda while watching the wildlife and birds that abound around the farm. Mariefields has a full sized modern timber kitchen with dishwasher, gas stove ,oven and microwave. Our kitchen is fully equipped with all the modern utensils you will need to cook a meal during your stay. If you do not wish to cook your own meals please ask us when you book and we can arrange for your meals to be prepared for you at a reasonable costs. Enjoy your meals served to you in our beautiful timber dining room close to the fireplace. There is large separate laundry with 10kg washing machine with full washing facilities. Guests by arrangement with Darren can use the separate Tea House with outdoor BBQ ,lounge chairs and games room with pool table and table tennis. This is located a short walk from the house though our coffee plantation. Take a short walk from the Farmhouse to the cattle yards ,chicken pens and dams with full of fish and wildlife. Feed the chickens and collect some free range organic eggs for your breakfast or catch a fish in our dam. Visit our private creek early in the morning and see if you can spot our resident platypus. Maybe take a bike ride around the roads on one of our bikes that are free for guests to use. Mariefields a working cattle and organic fruit farm. There will be a lot of opportunity for you to see daily farm life and personally be involved if you wish. Guests can collect your fresh free range organic chicken eggs or mangoes, olives,oranges,mandarins ,grapefruit ,lemons from trees when in season. We welcome you to our property and hope you make Mariefields your Home Away From Home when you stay with us. Your hosts Darren and Nicola live in the Tea House nearby to the 6 bedroom Homestead where you will stay. We are happy to help you with any needs or problems. Please ask us so we can advise you on the local attractions and what to do. If you do not want to cook your own meals please ask us and we can prepare some delicious meals at a reasonable cost. We are always happy to help you make your stay memorable and enjoyable so please just ask us. The accommodation is located among native bush surroundings to ensure guest privacy. At Mariefields Farm you have full access to our 165-acre property. As we live full time on the property for any questions or local tips whilst you explore the property or the beautiful Tweed Shire just ask one of us. The picturesque historic village of Tyalgum 5 minutes drive with the award winning Flutterbies Cottage Cafe, original Queensland hotel,monthly markets, art galleries ,gelato bar and shops. Great beaches are only 40 mins drive with the Gold Coast Airport 40 mins. We continue to develop low impact free range pasture poultry and pigs as well as tropical fruits, aquaculture, forestry, manuka honey and bamboo products. Our low intensity breeding of top grade organic grass-fed Angus beef cattle all help to ensure economic viability. There are extensive natural walking tracks on Mariefields and hectares of dams full of wildlife to explore. Birds and Wildlife can be seen regularly while sitting on the covered veranda deck or walking around the farm. We will show you Mariefields walking trails with lots of wildlife to see. There is a 3 km track to Pinnacle Nature Reserve, listed as World Heritage. We will show you where to go fossicking in the creek for gold or where to spot our resident platypus. We only ask you please CLOSE all gates behind you. Both bathrooms are fully renovated, tiled and modern. There are 2 separate toilets next to bathrooms in private rooms. there are many dams and lakes on the property full of water lilies and wildlife. see photo of separate dinging room with beautiful timber table and chairs. Extra chairs can be added as required. our creek has a private rock-pool where you can relax in cool mountain water. A great place for a family stay , a group get together ,a small convention or business meetings.